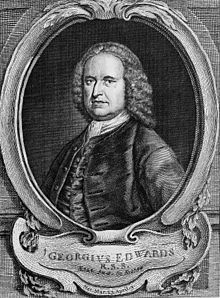 Linnaeus based his species description on the publication of George Edwards. 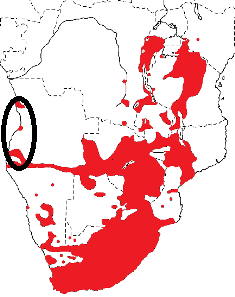 Linnaeus listed the type locality as Africa interiore. Edwards etched a copper engraving of the male from a living bird in the Greenwich aviary of George Shelvocke, Secretary to the Right Honourable the Earl of Leicester, Post-Master General (this Shelvocke is not the better known English Royal Navy officer). Shelvocke acquired a large collection of birds from Lisbon, the Southern Red Bishop having been shipped there from Angola. Edwards called it the Grenadier, after the Portuguese name Grenidiere, but probably referring to the red and black colours of the breeding male Southern Red Bishop which resembled the red uniforms and black headdress of the British Grenadiers. 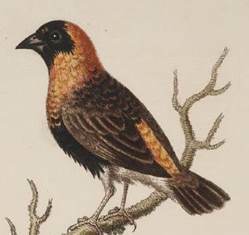 The first published reference to the Southern Red Bishop was long before Linnaeus or Edwards wrote about it. Johann Schreyer, a German soldier, arrived in the Cape of Good Hope (Cape Town) in 1668 and stayed for several years to work as a surgeon. He wrote a book (Schreyer 1681) and described many birds and animals, with some illustrations (but not of the bishop), and wrote of one bird: "as red as a glowing ember and the belly like fine black velvet, and live by the brooks". Of all the birds in Cape Town, only the Southern Red Bishop fits this description. This is one of the earliest published references to any weaver. Emberiza orix	Linnaeus 1758	Syst. Nat., ed. 10, p.177	Interior of Africa (Angola, ex Edwards, 1751, Nat. Hist. Birds, 4, pl. 178). orix (Latin oryza = rice); refers to the diet of the Red Bishop, which feeds on grain and seeds. Red Bishop, Grenadier Bishop, Scarlet Bishop. Unknown, sent to Lisbon, where purchased by George Shelvocke. Before 1750, when Edwards painted the bird. No type specimens known to survive, but the painting of Edwards serves as a type. Identification The Southern Red Bishop Euplectes orix breeding male is brightly coloured with black and red, and has a short tail. The combination of black mask and abdomen, with the crown, throat, breast, rump, upper and under tail coverts red, distinguishes the Southern Red Bishop from other red and black bishops. Females, non-breeding males and young birds are dull coloured and difficult to distinguish from other bishops and widows. The Southern Red Bishop was well known to early travellers and writers. For instance, in 1816 George Shaw wrote: "This species is gregarious, and builds its nest in large societies, among the reeds, near the rivers and ponds in the vicinity of the Cape of Good Hope and St. Helena: the appearance of these birds among the reeds is said to have a most beautiful effect, from the brilliancy of their colours." Distribution The Southern Red Bishop is a conspicous wetland species in southern and East Africa (see map below, based on Birds of Africa). Several subspecies of the Southern Red Bishop have been proposed in the past, but none are currently recognised since populations are not reliably separable on measurements nor on plumage characters. It has also been introduced to several countries, eg Australia (see here) and St Helena (unsuccessfully). Habitat This species has increased in numbers due to the building of dams and irrigation canals, and expansion of seed crops. Numbers are reduced, however, where wetlands are drained. Food The Southern Red Bishop feeds mainly on seeds, and also on insects in summer and when feeding young. 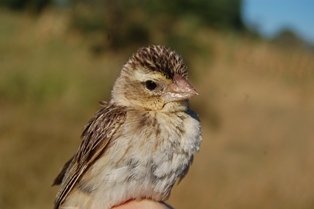 24 seed species, mostly small, were recorded in the Free State, South Africa. Chicks are fed on arthropods including dragonflies, beetles, caterpillars and spiders, and eggshell fragments have been found in chick stomachs. It is a significant crop pest in wheat fields in the south-western Cape, South Africa, where up to 70% of the crop may be destroyed in some fields. Birds generally forage in two sessions daily, morning and late afternoon, and gather in day roosts during the middle of the day. The oldest bird is over 13 years (see here). Breeding The Southern Red Bishop is polygynous, with up to 7 females nesting in a male's territory at any one time, and up to 18 females in a breeding season. It is colonial, with colonies of several hundred nests in reeds; nests are also found in small groups and sometimes a pair nests solitarily. The nest is an oval, with a side entrance under a porch near the top. The nest is tightly woven of thin strips of reed or grass blades, and lined with plant down and grass seed heads. The nest is built by the male and may be completed in a single day, but usually takes 2-3 days. Initially eggs are visible through the weaving, but as the female adds lining during incubation the nest walls become opaque. The average clutch size is 3 eggs, but the mean clutch size is larger in years of heavier rainfall. The female incubates for only 40% during the day, with bouts in the nest of 1-10 minutes and absences of 1-12 minutes. Some nest predators that have been recorded are water monitor, egg-eating snake, rats, slender mongoose, Cattle Egret and White-browed Coucal. Old nests used by Tawny-flanked Prinia Prinia subflava, Zebra Waxbill Sporaeginthus subflavus and other species. Climbing mice Dendromus mesomelas take over old nests of weavers, including the nests of Southern Red Bishops. The Southern Red Bishop is a major host to the Diderick Cuckoo Chrysococcyx caprius but high rates of brood parasitism are found only at small colonies where all the territory-holders may be absent at the same time (see here).